Borderlinx | Buy Dyson and ship worldwide with Borderlinx. Cheap rates guaranteed. No one wants to live in a messy house, but no one wants to waste hours of his or her precious free time cleaning up either. For decades, Dyson USA has been developing and selling high-tech innovative products that make our lives so much easier when it comes to keeping our lives clean. Dyson USA products use the latest technologies to design vacuums, heaters, hand dryers, fans and other products that are as ergonomically sound as they are effective. And thanks to Dyson USA's strong core values regarding corporate social responsibility, you can feel great while keeping your house looking great! Dyson USA is constantly coming up with new products to keep our houses and lifestyles at their best. While best known for its vacuums, the Dyson USA collection also includes fans, heaters, and top-of-the-line hand dryers. And among this season's range of Dyson USA vacuums, you will find various models that are cordless, canisters, handheld, without a bag, or even specialized for allergies! And don't forget about the Dyson Ball! Prices at Dyson USA vary depending on the equipment, but you can except to pay a couple hundred dollars for most models. 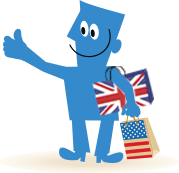 Buying Dyson in the USA and having it shipped to you abroad for cheap just got that much easier thanks to Borderlinx. And best of all, you can avoid any unpleasant surprises with shipping, tax & duties thanks to our innovative Shipping cost calculator. A number of services are available through Borderlinx to make international ordering from Dyson USA hassle-free, including concierge, free repacking and consolidation services.